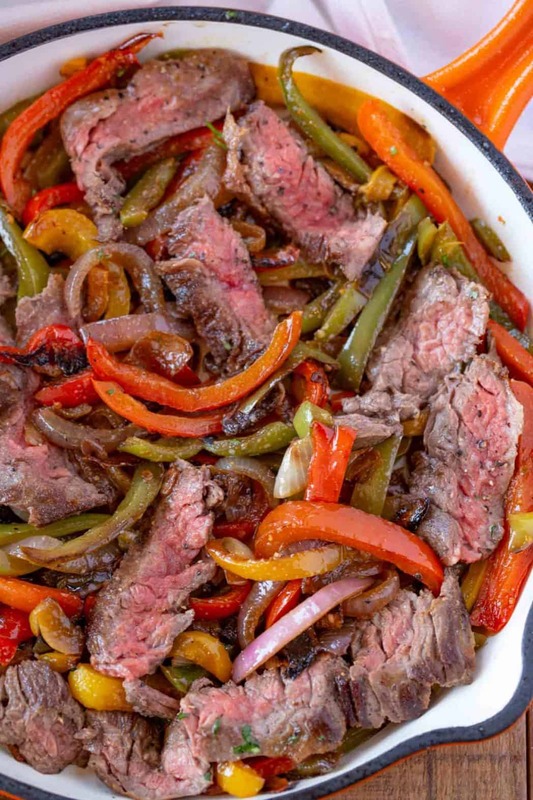 Steak Fajitas made with an easy homemade fajita seasoning, skirt steak, bell peppers and onions in a one skillet in just 30 minutes! 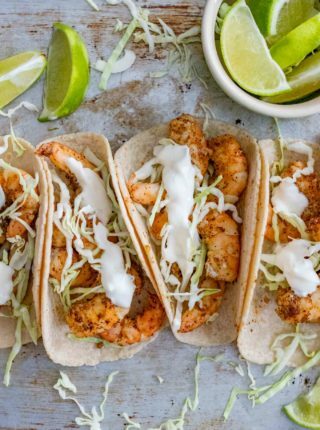 Easy Mexican recipes like Chicken Fajitas, Easy Carne Asada and Shrimp Tacos are some of our favorites on the site because they’re restaurant quality and can be made at home for a fraction of the cost! 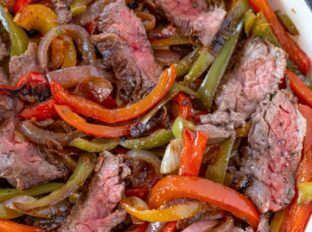 Steak fajitas are one of the most popular meals ordered in Mexican restaurants across the United States for a reason, they’re delicious and flavorful and healthy! 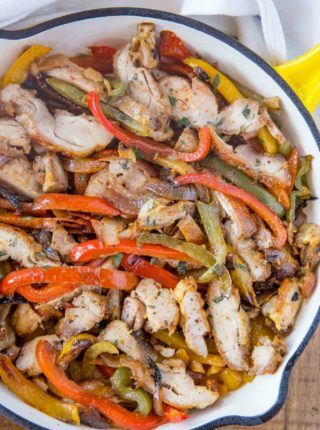 Most restaurant food is full of extra fat and salt and with this healthy fajita recipe we can control all ingredients. You can use any other proteins you’d like for this recipe, I link to my chicken version above but pork loin or seafood would also be great for the same base ingredients. 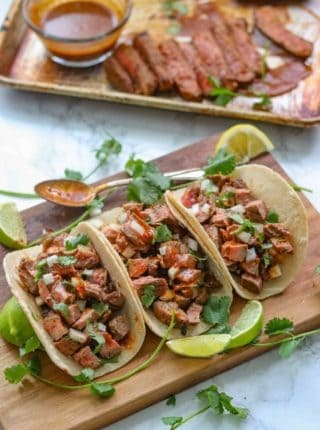 Similar to Carne Asada the best cut of beef for fajitas are either flank steak or skirt steak. They’re tender, easy to cook and when cut across the grain perfect for layering in tortillas along with vegetables and toppings. If you use other cuts of beef, like a ribeye, you can refer to cooking times for your chosen cuts on the FDA’s website for beef cooking times. 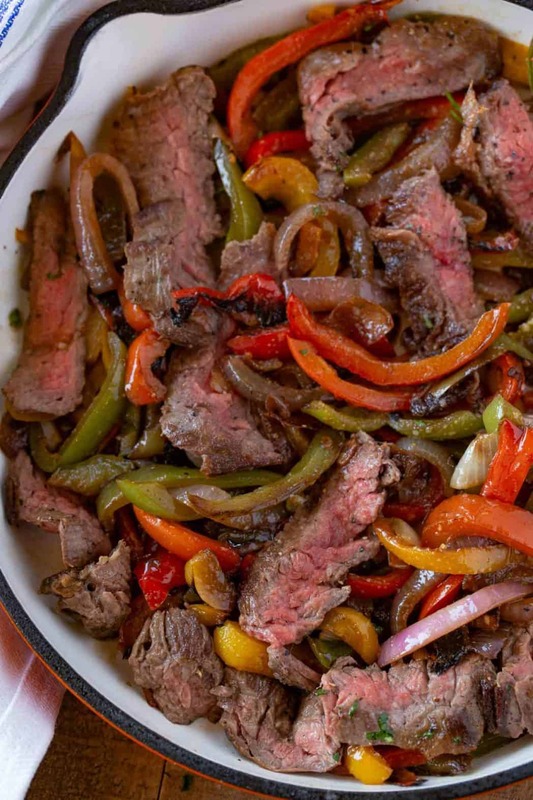 Steak fajitas are delicious grilled over medium high heat for 4-5 minutes on each side. Cook the vegetable portion in a grill basket, and for steak fajitas I also like to grill the green onions on the grill along side the steak too (I used to order sides of these when ordering meals from Baja Fresh years ago). Let the steak rest for five minutes before slicing thinly against the grain. If cooking on a sheet pan line everything up in as even a layer as possible and roast at 400 degrees for 14-16 minutes. If you crowd the pan too much the food will steam instead of brown at all and it will taste boiled. Marinade: Marinating the steak before kicks up the flavor so much more. Sour Cream: you can use sour cream or a crema from my Beer Battered Fish Tacos recipes. Guacamole: use my perfect Chipotle copycat recipe. Salsa (Pico de Gallo): this recipe is a great fresh restaurant version in five minutes. Refried Beans: These homemade refried beans put the canned variety to shame. Queso: If you’ve never used queso as a topping you’re missing out. Mexican Rice: The ultimate easy side dish for all Mexican food and I have a green rice version too. You can serve them in flour tortillas or corn tortillas or over lettuce in a tostada shell for the easiest options. Serve over rice in a classic burrito bowl presentation. Chop up the leftovers and cook inside a quesadilla. Add the chili powder, kosher salt, paprika, cayenne pepper and the cumin to a small bowl and mix before rubbing on the steak and letting marinade for 30 minutes (optional). Add half the canola oil to a large cast iron skillet on medium high heat and add the skirt steak to the pan, cooking for 3-4 minutes on each side before removing from the pan. 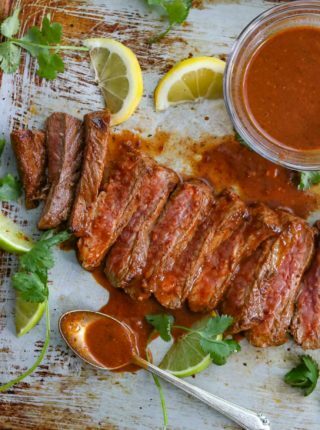 Slice the steak against the grain thinly, add it back into the pan and squeeze half the lime wedges over the pan before serving. Looks so delish! Love all the flavors packed on this, need to make this soon! I love making these during the week for dinner because they are SO easy! 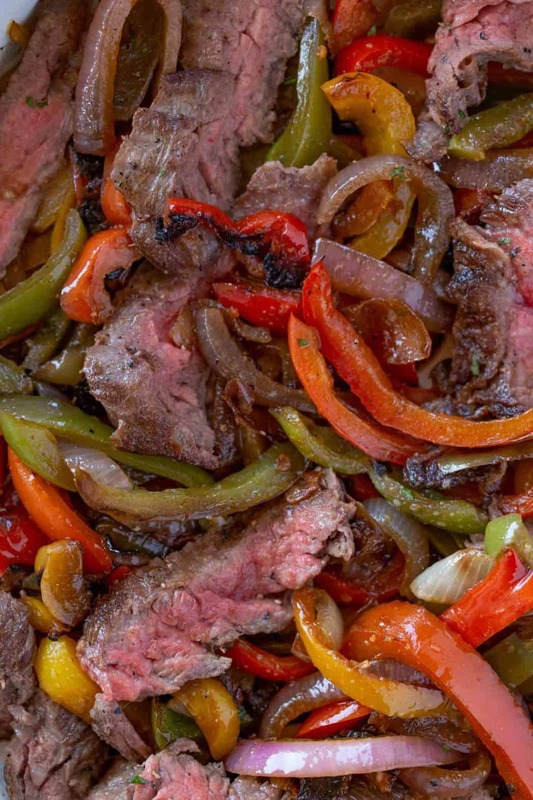 Oh my my…I love fajitas and yours look totally delicious. This would be the delicious recipe for the weekend. I love coming to your site when I have no idea what to make for dinner. You always have the best recipes that my family loves and this one looks like another winner to me. Making it tonight.